I decided to revisit the overshot runner project with the 2/16 mercerized cotton warp. 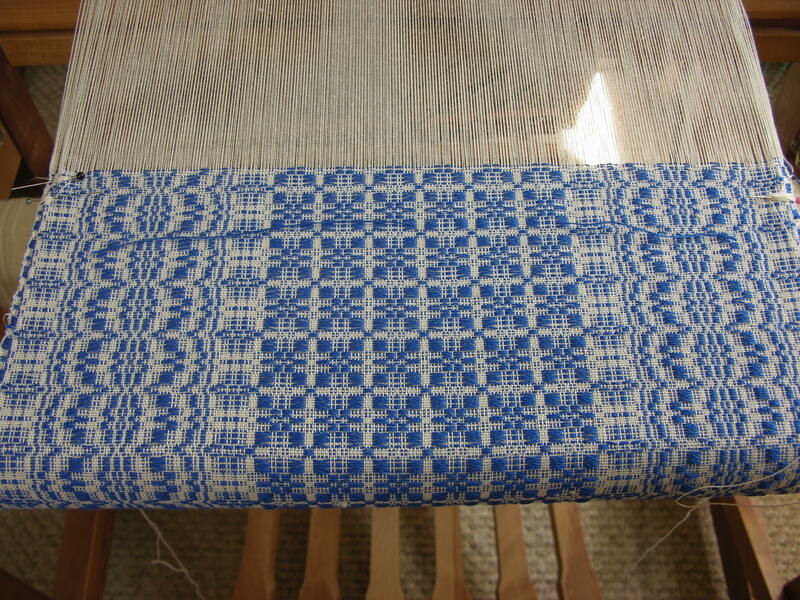 But instead of trying to continue on the existing warp, I decided to make a new warp and put it on another loom. I made a shorter warp than before, only about 3 yards, using a warping board. Since this loom has a plain beam, the warp was beamed in the usual manner. I also replaced all of the existing heddles with brand new inserted eye heddles. I wanted to see if these changes would provide me with a more pleasurable weaving experience (i.e. no broken threads). Things seemed to progress okay, but then 3″ into the pattern, the first thread broke. After another inch, one more, and after another inch, well you get the idea. I have now woven 20″ and have repaired 11 broken threads. I am not getting any joy out of this project. I love the pattern, I love weaving overshot, I love the colour combination, I hate this yarn. I am not thrilled with the 2/8 mercerized cotton I am using for the weft either. It seems to be loosely plied and twists on itself and around the tabby yarn as well. So here is a shot of it before I cut it off the loom. I have to find a use for the remaining 2/16 (fire starter? ), and when I find a better quality yarn, I will try this project again. This entry was posted in Uncategorized and tagged 2/16, 2/8, cotton, mercerized, overshot, runner, weaving. Bookmark the permalink. The pattern is gorgeous! I hope you can make it work someday!